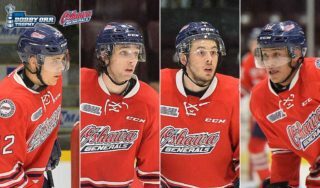 The first February instalment of the OHL This Week takes a look at what’s happening across the league. 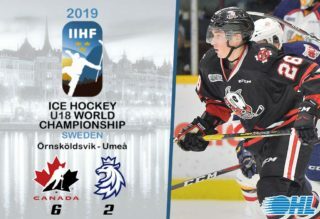 The Don Mills Flyers, Toronto Nationals, Toronto Marlboros and Toronto Red Wings have all secured a spot at the 2019 OHL Cup Powered by Under Armour. The first installment of the Road to the OHL Cup takes a closer look at the GTHL, a perennial producer of some of the OHL’s top young talent. Read more at OHLCup.ca. The Erie Otters and host Mississauga Steelheads have rescheduled their previously postponed game for Tuesday March 12th at the Paramount Fine Foods Centre beginning at 7:00pm. 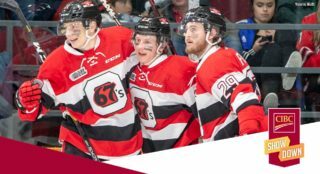 Petes to play 2000th home game on Thursday: A storied OHL franchise, the Peterborough Petes will play their 2000th regular season home game on Thursday when the Ottawa 67’s visit the PMC. The good folks from the Kawartha Sexual Assault Centre will be in the building as part of the OHL Onside initiative while it’s also CMHA Talk Today Night in Peterborough. Visit gopetesgo.com for full coverage of this weekend’s events. Frontenacs host Hockey Jersey Night on Friday: The Kingston Frontenacs are inviting fans to wear their favourite hockey jersey to the rink on Friday when they play host to the Peterborough Petes. Get in on the fun and wear your favourite threads from any era! REACH. Shoot. Score! this Saturday at the Bayshore: The Owen Sound Attack are excited to host the second annual REACH. Shoot. Score. charity game in support of the REACH Centre of Grey/Bruce. Saturday’s home game against the Kingston Frontenacs will be a fundraising effort for the REACH Centre of Grey/Bruce as the Attack will wear specially designed theme jerseys to be auctioned off post-game. For full details on Saturday’s event visit attackhockey.com. Steelheads excited for Pucks N’ Paws event: The Mississauga Steelheads will host a special Pucks N’ Paws Game on Sunday afternoon at home to the Windsor Spitfires. The Steelheads are inviting fans to bring their dog to the game! There will be a number of animal wellness, rescue and retail vendors on site. For full details on Sunday’s event, visit mississaugasteelheads.com. Finnish Day in Sudbury on Sunday: The Sudbury Wolves will welcome Finlandia Village and the Sudbury Finnish community to Sunday’s game against the Niagara IceDogs. The first 1000 fans into the building will receive a limited edition Ukko-Pekka Luukkonen Finnish flag. 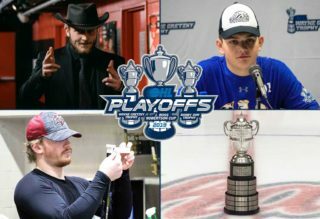 For the full rundown on the upcoming weekend in Sudbury, visit sudburywolves.com. Burns ties NHL record for most overtime goals by a defenceman: Brampton Battalion graduate Brent Burns tied an NHL record on Saturday, scoring the 13th overtime goal of his NHL career to tie Scott Niedermayer for the most by a defenceman in league history. Burns’ winner pushed the San Jose Sharks past the Arizona Coyotes 3-2. The 6-foot-4, 235Ib defender has 58 points (10-48–58) through 54 games this season. The 33-year-old from Barrie, Ont. is in his 14th NHL season and was the NHL’s Norris Trophy winner in 2017. Burns spent the 2002-03 season with the Brampton Battalion and also won silver with Canada at the 2004 World Juniors. He was Minnesota’s first round pick in the 2003 NHL Draft. Verhaeghe named AHL Player of the Week: Niagara IceDogs graduate Carter Verhaeghe of the Syracuse Crunch is the AHL Player of the Week after recording two goals, four assists and six points over two games. A fourth-year pro, Verhaeghe now ranks second in AHL scoring with 54 points (22-32–54) over 43 games. The 23-year-old Waterdown, Ont. native has increased his offensive production every year, and has totaled 61 goals and 86 assists for 147 points in 178 career AHL games with Syracuse, Bridgeport and Toronto. Verhaeghe spent four seasons in Niagara from 2011-15, graduating as the team’s captain while collecting 224 points (83-141–224) over 262 career regular season games. He was Toronto’s third round pick in 2013. Nedeljkovic named AHL Goaltender of the Month: Niagara IceDogs graduate Alex Nedeljkovic has been named the AHL Goaltender of the Month for January after playing to a 6-0-0 record in seven appearances with the Charlotte Checkers, allowing 12 goals on 189 shots for a 1.78 goals-against average and a .937 save percentage with two shutouts. The 23-year-old native of Parma, Ohio also made his first career NHL start on Jan. 23 and stopped 24 shots in the Carolina Hurricanes’ 5-2 win at Vancouver. The OHL’s Goaltender of the Year in 2014, Nedeljkovic played four OHL seasons between Plymouth and Niagara, finishing with a record of 89-77-8-12 with a 2.88 goals-against average, .918 save percentage and 10 shutouts over 191 regular season games. He was Carolina’s second round pick in 2014. Smith tells kids it’s about hockey, not colour: Kitchener Rangers graduate Givani Smith is sharing his story as a player of colour in the pro ranks. 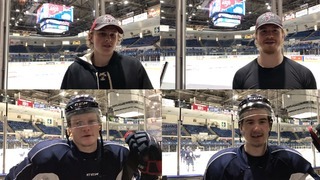 The Grand Rapids Griffins forward and Detroit Red Wings prospect spoke to about 50 parents and kids, most of them African-American, at a dinner put on through the Griffins Youth Foundation. It’s part of Black History Month which, for the first time, is being recognized by the NHL. 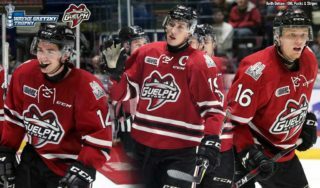 Smith recently wrapped up a four-year OHL career spent between Barrie, Guelph and Kitchener that included 135 points (73-62–135) over 236 regular season games. The 20-year-old was a second round pick of Detroit in 2016. Peter Wallner has the full story at MLive.com. Helvig named ECHL Rookie of the Month: Kingston Frontenacs graduate Jeremy Helvig of the Florida Everblades has been named the ECHL Rookie of the Month for January. Helvig went 6-0-0 with three shutouts, a 1.22 goals-against average and a save percentage of .954 in seven appearances during the month. The 21-year-old allowed two goals or less in six appearances and made at least 24 saves four times. Carolina’s fifth round pick in 2016, Helvig is 15-3-3 in 22 appearances with the Everblades this season and ranks third in the ECHL with a 2.16 goals-against average. He is on a personal 12-game winning streak dating back to Dec. 5, which is tied for the fourth-longest streak in ECHL history. Helvig wrapped up a four-year OHL career last season, finishing as the Frontenacs’ career leader in wins (81) and shutouts (10). McFarland announces retirement: Former first overall OHL Priority Selection choice John McFarland has announced his retirement from hockey. The 26-year-old had split this season between the AHL’s Bakersfield Condors and the ECHL’s Wichita Thunder. The Richmond Hill, Ont. native appeared in three NHL games with the Florida Panthers during the 2015-16 season after being a second round pick by the club in 2010. McFarland played four seasons in the OHL between Sudbury, Saginaw and Ottawa from 2008-12, recording 190 points (90-100–190) over 219 career regular season games. Opilka accepts coaching job at Maryville University: Kitchener Rangers graduate Luke Opilka has transitioned from the crease into a coaching role at Maryville University. The 21-year-old from St. Louis, Mo. recently announced his retirement from the game following a string of hip injuries and has taken on an assistant coaching position at the ACHA Division II school. Opilka played two seasons in Kitchener from 2015-17 and was a fifth round choice of St. Louis in 2015. Two teams that have struggled in recent weeks, the Windsor Spitfires and Erie Otters are locked up in a battle for the final playoff spot in the Western Conference. The two teams meet in Erie on Saturday as the Spits try and build on their four-point cushion on eighth place. Windsor’s youth has been the story this season as the rookie tandem of Jean-Luc Foudy and Will Cuylle continues to turn heads while sophomore winger Daniel D’Amico leads the team in scoring with 43 points (21-22–43) over 51 games. The Otters look to rebound from an 8-4 loss to Kitchener on Wednesday as they host Oshawa on Friday before the Spitfires visit on Saturday. Rookie defenceman Jamie Drysdale continues to see plenty of ice on the Otters blue line while third-year veteran Gera Poddubnyi leads the team offensively. The Otters have taken two of three from Windsor this season but the Spits prevailed in their latest encounter, taking a 5-0 win on Jan. 17th. Entering the weekend deadlocked at 51 points apiece, the Kitchener Rangers and Sarnia Sting will meet on Sunday afternoon as both teams look to climb the Western Conference standings. With fifth place Owen Sound having dropped eight of their last 10, both Kitchener and Sarnia have an opportunity to gain ground this weekend. The Rangers have won seven of their last 10, getting big contributions from Joseph Garreffa who recorded his first OHL hat-trick on Wednesday along with 36-goal scorer Jonathan Yantsis. Rickard Hugg has multi-point performances in seven of his last nine games. The Sting are riding the eight-game point streak of captain Ryan McGregor as they continue to find ways to create offence. First-year forward Jacob Perreault sits second among OHL rookies with 45 points (25-20–45) over 47 games. The Rangers have won two of the three prior meetings between the two teams this season.